During my maternity leave, my mom has driven up to Charlotte one day a week to give me an extra set of hands. This has been absolutely invaluable ... and a lot of FUN. I have always appreciated her so much, but seeing her as a grandmother now, the way she loves Camille with her whole heart -- it is truly the best. 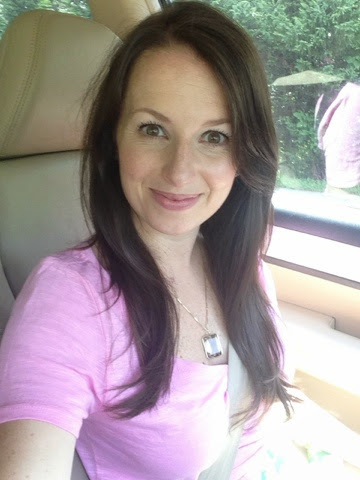 Her weekly visits are also a great time for me to get some errands done that are easier to do solo -- I've been to the doctor, eye doctor, and dentist, and this past Thursday I got my hair chopped! The decision was made around 3am the night prior when we had a little spit-up-in-the-hair situation. No bueno. I had about four or five inches taken off, layers added too. It was a huge change from how long it was to begin with. My hair inspiration was Sonja Morgan from Real Housewives of New York. She's such a hoot -- maybe my most favorite of the Housewives. And this season, her hair is ON POINT. I showed these two photos to my hair gal. I love having shorter hair, and although I didn't think those few inches would make a big difference in styling time, they really do! Saturday night Ian and I decided to throw a little caution to the wind and we had a date nite. Camille was with the best babysitter ever, I'll give you one guess. 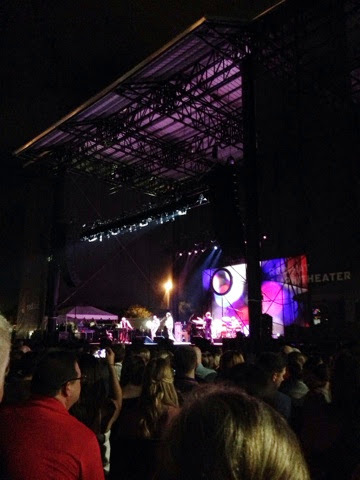 :) We saw Ray Lamontagne in concert and loved, loved, loved the show. It was a sit-down concert which was awesome. Not to sound old, but that was the best. Isn't it a little crazy that we all buy seats at concerts and then stand in front of them the whole time? Although he didn't play our wedding first dance song, You Are The Best Thing, he put on quite a show! We missed our Millie but loved the time together as a couple. Time for us to head out to Baby Power Hour this morning so mama can get her sweat on. Happy Monday! 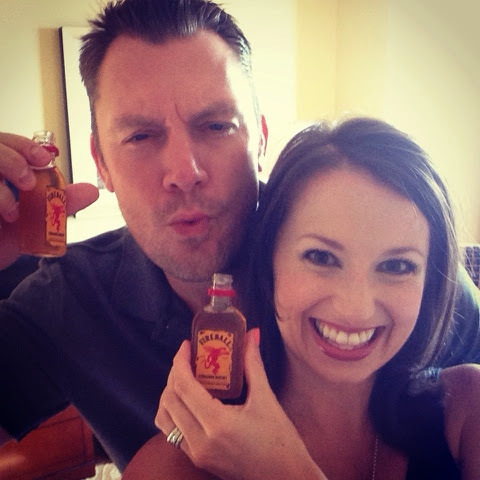 I actually drank a fireball shot over the weekend at the beach. HOLY SHIZNAT! 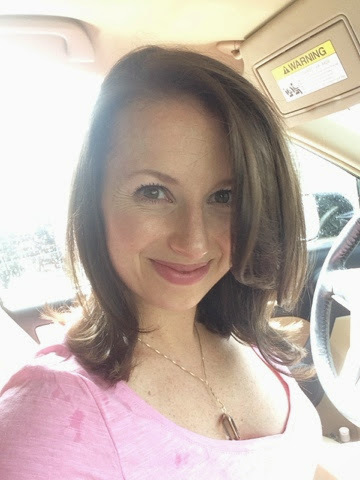 I chopped a few inches off Friday too!! It feels so much better! I can imagine how much better yours feels & especially after the spit-up incident. LOL! Those days are ahead for me... :) Sounds like a fun weekend though & a great date night out! Your hair looks amazing! I have an appointment in two weeks and may chop it after all the tugs (ouch!!). That is really sweet your mom comes down! There must be something in the air hair-wise...I just made an appointment to get mine cut off next week! I'm going for a long bob style. LOVE Ray Lamontagne! Hair looks fab! And GREAT date night out - good for yall! LOVE your new hair cut! It looks so healthy and fresh! I've been dying to him in concert and love that yalls wedding song was You Are The Best Thing, its definitely my favorite! Hope you have a great week love! Love your hair cut!!! Looks so fab! Love the hair!! So cute! And love Ray Lamontagne!!!! What a fun date night!! What a fabulous weekend! Thank goodness your mom is close enough and able to come up each week! I know Camille is loving spending extra time with her grandma and some time alone for your is definitely invaluable! Love the new haircut by the way. I've been dying to chop mine off for over a year but I just can't bring myself to do it. Sonya is my favorite as well. She is so funny and sassy! Love the hair~! New 'do looks great!! Love having grandmothers who want to be involved. I miss BPH and Storytime! I've learned that not all storytimes are created equal. Sounds like a fun date night! You shorter hair looks amazing. I'm looking forward to going shorter this fall. Love baby workouts!! We were all about the mommy and me yoga! I love the new cut! Glad you had a great weekend! Date nights are the best. Love your "mom cut". Sooooo cute. Hubby and I had a concert date night this weekend too! A friend watched all 3 of our kiddos. Glad you had a great weekend! Ahh the mom chop! I decided to do that early and saying goodbye to 4.5 inches of hair is still haunting me. However I know once I have a little lady crying in the background while I am getting ready I will be thankful. I bet Ray in concert was amazing, I love him. I already have a babysitter (aka grandma) lined up to see Citizen Cope in SF with the hubs in November, looking forward to it he is amazing live! Love the haircut!!! It is the perfect shape - looks fabulous! Love the new hair! I love Sonja's hair and was just looking for a photo of her hair this week! I love how it looks when she talks to the camera on RHNY. I was having trouble finding the right photos but these are great! What Do You Love About Blogs?